It's that time of year again. The leaves are beginning to change colors, and a chill is most certainly in the air. What better time to pick up a book about, you guessed it, Fall?! 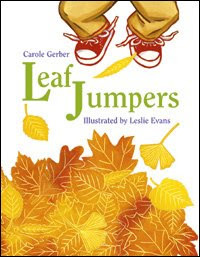 Leaf Jumpers is about just that. Young readers will enjoy following along with this brother sister duo as they make a learning adventure out of yard clean up. As the children work to rake all the fallen leaves from the grass, they stop to notice each one's shape, size, and color. From the common oak leave to the more peculiar ginko leave. Readers will enjoy the bright array of colors and rhyming story that they won't even realize they're actually having a mini biology lesson and learning something too. My 3 year old loves this one, and I'm just waiting for her to start naming out the leaves the next time she happens upon them outside. That'll be a proud mommy moment for sure. What kid, who lives in a climate where the leaves change colors and fall off the trees, hasn't experienced the fun of raking all the fallen leaves up, only to turn around and send them flying from their neat piles with a hearty jump and roll? Seriously, I believe this should be a requirement for all kids. There's just nothing quite like the crisp air, combined with a big full pile of crunchy leaves to inspire a child- or an adult, for that matter- to want to throw caution to the wind and live a little. JuMp!